arts to new audiences in Ireland. locked on to the pursuit of profit margins at any cost year after year. audiences to contemplate anew their own ideas of what is meant by the descriptive term 'electronic art'. 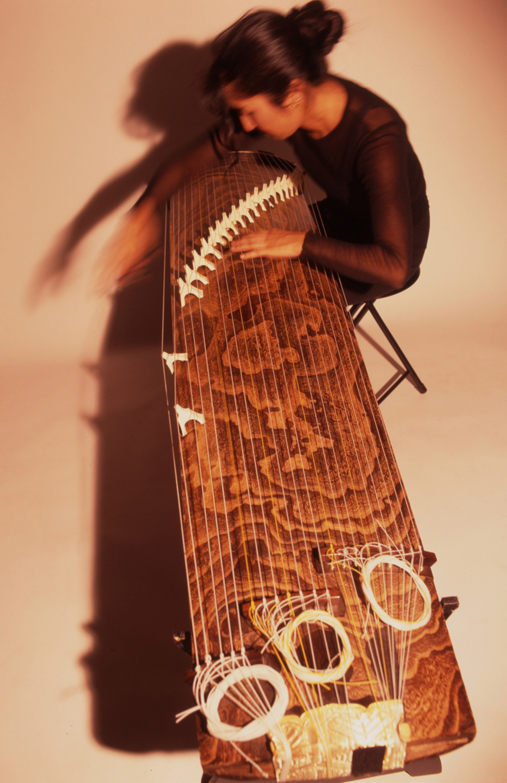 Some musical highlights of this year's programme include a return appearance for the world-renowned thereminist Pamelia Kurstin who last performed at DEAF in 2005; also, performances by Wu Fei (a Beijing-born student of the traditional guzheng who has marked out a space for herself by taking this traditional instrument into a contemporary setting) and Miya Masaoka (a leading Japanese koto player, composer and performance artist whose sound projects have explored race and the interconnectedness of different species). We are privileged to have been kindly granted space for these performances in the hallowed settings of St. Audoen's church, in Cornmarket on High Street - beautifully restored relic of another different wave of migrants, who reached Ireland from foreign shores circa 1200 AD. We are also blessed to have received such a positive response from the artists so far invited to participate: a collaborative improvisational performance is planned between Masaoka and local musician Daniel Jacobson, while Kurstin will be stepping into the role of tutor for the return of the highly popular 'DEAF Junior', a series of interactive classes aimed at introducing 10-14 year-olds to the processes of making and recording their own electronic music. Other highlights for 107 include a special presentation by the veteran cinematographer, the Australian-born Christopher Doyle, describing hisexperiences as a pivotal figure in the Hong Kong film industry for more than twenty years, plus Trevor Knight will present a live collaboration between Gyohei Zaitsu(Japan): Butoh dancer, Itaru Oki (Japan):trumpet and accessories and Trevor Knight (Ireland): keyboard /electronics called 'Featherhead'. Once again DEAF will also be collaborating with Darklight Film Festival, this time to host a special screening of the controversial Thai film 'Tropical Malady' by Director Apichatpong Weerasethakul, plus visually stunning new anime Tekkonkinkreet - directed by American Michael Arias/Studio 4°C, Japan & soundtrack by UK electronica veterans Plaid, both to run over festival weekend at the IFI. With live club appearances from the likes of D-Styles, Jazztronic, Ray Mang, Lee Douglas, UR live and The Boredoms amongst many other performances (including an all-day improv session to be run out of the karaoke booths of a city centre oriental eatery), we believe that DEAF 2007 offers not just entertainment, and an in-road into the electronic arts for new audiences, but also a positive statement in favour of multiculturalism - at a point in time in which we in Ireland perhaps need reminding of its many benefits. DEAF 2007 partners: Arts Council, Dublin City Council, IMRO, Tiger Beer, Totally Dublin Lyric FM, and Newsxpress.